When it comes to Star Wars, three seems to be the order of the day. Three chapters: Episodes I - III, IV - VI, VII - IX. Hence each film, also part of a trilogy. Whilst six and counting, first of each trilogy that's most noteworthy. In 1975, Star Wars (now called Star Wars Episode IV: A New Hope) becoming the then highest grossing film. In '99, Episode I: The Phantom Menace also shattering box office records. Hence, Episode VII: The Force Awakens has a LOT to live up to. Personally, I'm confident. Why? Yep. Hansolo! Leia! Luke! Chewbacca! C3PO! R2D2! Even Admiral Ackbar! Original caravan of courage, in what seems every bit a thrill-ride as the original...of the original. Back then: infiltrating the Death Star to rescue Leia. Now: garnering resistance to new baddies. With our idols back in action, alongside composer John Williams, there'll be a definite touch of nostalgia. Before you accuse me of doubling up, allow me to elaborate. Whilst we're delighted to have Han' back, there's a chance... oh, I'm fighting the tears now.. Um, there's a chance he won't be back for the next installment. Yep, yep. As much as we treasure his quips and hyperdrive prowess, there's justifications for this theory. First, it's been reported arch villain Kylo Ren is his and Leia's son. Yeah, doesn't sound good for Han'. But when combined with the tradition of sons vanquishing fathers, he's on the hit list - which makes for one heck of a showdown (or tear jerker). Second, it's known that Harrison Ford felt his character should've already been eliminated. 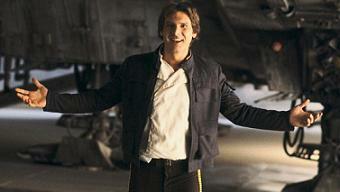 Perhaps cos (and despite universal adoration for Han) he's essentially dispensable. And third, Ford's now 73, and probably wants a little peace and quiet. Boba Fett may be returning. Reason(s) I exclude this from above - i) still unconfirmed ii) may amount to a mere mention (given his prominence in an upcoming spinoff). Why this taciturn enigma's so popular's beyond me. Nevertheless, does make sense to resurrect him after he was so ruthlessly disposed of down a 'mouth'. 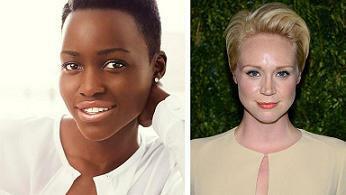 In addition to Harrison Ford, Luke Hamill, Carrie Fisher, there's a goodie-basket of supporting actors: Lupita Nyong'o, Gwendoline Christie (both pictured), Simon Pegg, Oscar Isaac, even a Daniel Craig cameo! With the main heroes (of this trilogy) said to be up-and-comers Daisy Ridley (as Rey) and John Boyega (as Finn), there's an army of powerhouses. JJ's been entertaining audiences since his college years. This tour de force, Hollywood running through his veins, has an impressive track record: Lost, Star trek, Mission: Impossible III, Armageddon. If anyone's going to take over the reins from George Lucas, you want JJ. If you're anything like me, you recoil upon watching what resembles a cartoon. Artificial appearances, unnatural motions, computer-generated imagery can easily ruin the moment. JJ's obviously onto this, as he's emphasized a move away from CGI, back to props and actual actors. Unlike the prequel trilogy (Episodes I - III), we don't know where this encore trilogy will venture. We know where it begins: Luke in hiding, Han' meandering, Rey salvaging, dangerous Empire-inspired cult, with Finn defecting. But don't know where it'll end - which exponentially ramps up the excitement. Session times & tickets now available. For a further discussion on the story, click here.